Nothing can prepare you to Delhi. We arrived to New Delhi after 6 hours uneventful flight from Istanbul, at the airport we took the express train to the city center. A clean and frequently running train gave me the impression India is not what everybody talks about. WRONG! I’ve been through books, TV shows, talks, guides and yet, nothing could prepare me for the crowds, the smell, the constant horns blowing, and the peddlers desperately trying to “help” you around. I lost count of the amount of rickshaw drivers offering themselves to take us to our hotel, which is only 200 meters away. Dirt is everywhere, trash covers the sidewalks, sewage flows on the streets. And yet, there’s something unique to this place to be discovered. Side by side to the endless slums, there are also huge expansions of parks and monuments carefully kept. Beware of scams: the rickshaw drivers and their very friendly peers are eager to start a conversation, they all end up in alternative tourist information centers. They will tell you that: “You need to buy ticket before”, “The site is closed, I’ll take you to the TI, where they’ll guide you”, “I’m not tring to sell you anything, you should go there to get info.” And the last one: “Your train is delayed, go to the TI and they will refund you and give you a better ticket”, they have very sophisticated ways and it’s hard to tell if they are trying to trick you. Sadly, this is most of the times. It’s hard not to generalize and paint all locals as scammers, it’s also hard not to be empathetic. Our first days in India were shocking in every single way: I hope in the coming days we’ll get better and meet more locals to get to know better the people and culture of this amazing country. 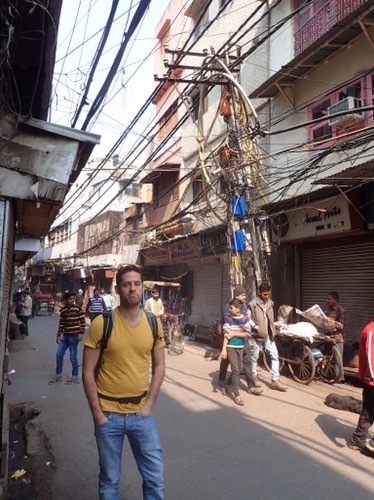 Tal and the entangled cables. Thanks for your reply. I’m sure some pubs/hotels are more upscale than most of the places we’ve been, but we wanted to know your country as it is. We didn’t receive any bad attitude although we were not being too outward. I hope to visit India in the future, I love the country and its people, although it’s very different from our country.